Organizations continue to experience billions in damaging losses due to data breaches. 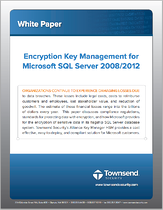 Protecting your SQL Server database with encryption is now easier than ever. Increased security of your encrypted databases SQL Server encryption to meet compliance regulations such as PCI DSS, HIPAA/HITECH, GDPR, GLBA, FFIEC, etc. Recognizing the importance of proper key management for data protection, Microsoft implemented Extensible Key Management (EKM) in SQL Server 2008. EKM is both an architecture for encryption key management services, and an interface for third-party encryption key managers such as Alliance Key Manager from Townsend Security. While EKM provides for local, on-server management of encryption keys, Microsoft and third-party security professionals recommend the use of external key management solutions for Enterprise customers. Key Management solutions can be network-attached hardware security modules (HSMs), cloud-based HSMs, virtual machines, or true cloud instances. Alliance Key Manager is designed for use with Microsoft SQL Server EKM as a hardware security module, VMware virtual machine, or in the cloud (AWS and Microsoft Azure).